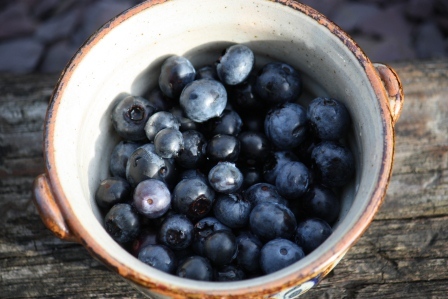 An August garden tour – Potatoes, Blueberries, Pumpkins, and Apples! I like it. We’re still learning. And growing. And changing. But I think it is all good. 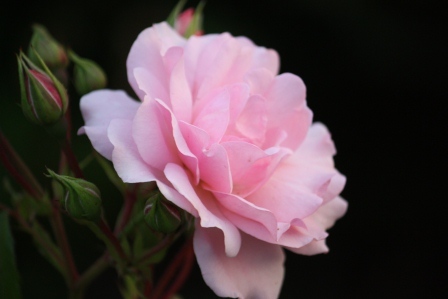 I tend to only put “pretty” pictures in the blog. I’ll change that this week. 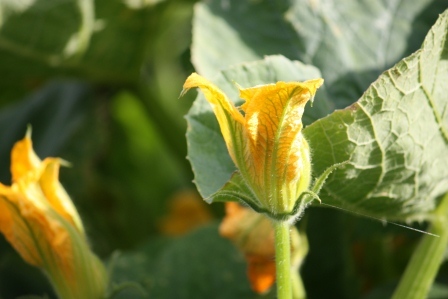 One picture shows what should be the pretty pumpkin flower, but this one is eaten by slugs. We have had so many, many, many slug this year! It’s amazing we have an abundant harvest given how much was sacrificed to slugs. 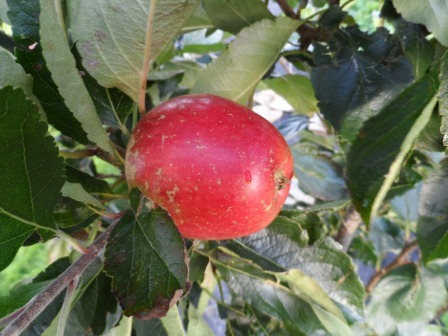 We’ll be changing the layout of the fruit orchard this winter. The strawberries needed more space than we planned so we’ll be spreading them out. 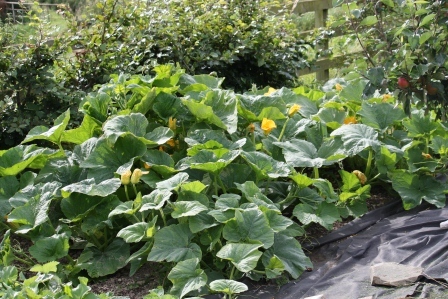 Now about the pumpkins: they take up a lot of space! But I love seeing their flowers so late in the summer. 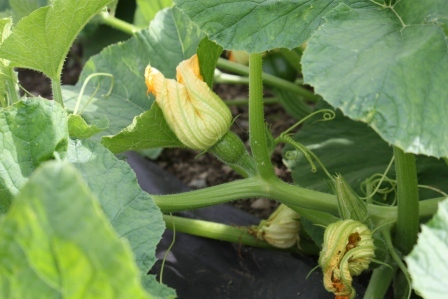 We’re hoping for some pumpkins this year – if they survive the slugs! Luckily, our potatoes haven’t been affected by the slugs. Our main crop variety of Organic Sarpo Mira are delicious. The soil is excellent after the compost worked through it. 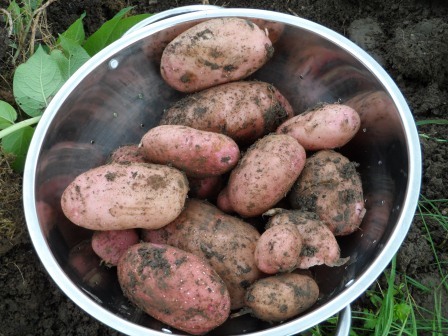 It’s quite easy to fork up the spuds, wipe off the dirt, and boil them up! 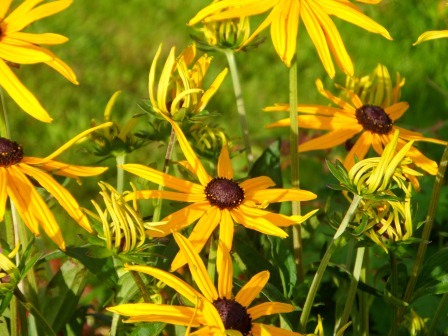 I think they just might be our favorites of the garden (for the moment, anyway). I hope you have access to fresh garden vegetables this summer! P.S. I changed my blog around a little bit. I hope you like it! 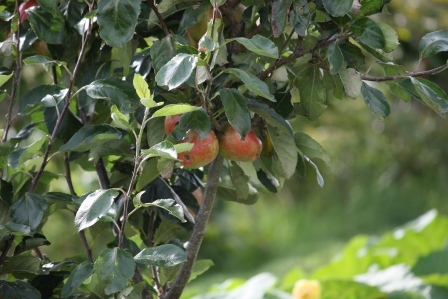 A view of the fruit orchard. 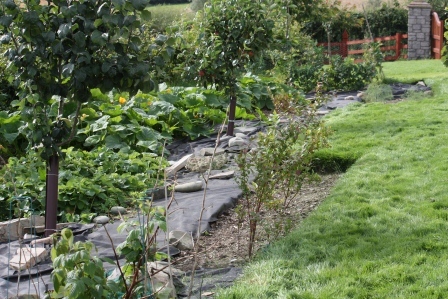 The rhubarb has been cut, strawberries are overgrown, and the pumpkins are taking over! Apple trees are happy. Another view of the fruit orchard. The blueberry plants on the right aren’t very big, but we were surprised by all of the yummy fruit! Our eating apples coloring nicely. The pumpkins growing like crazy. 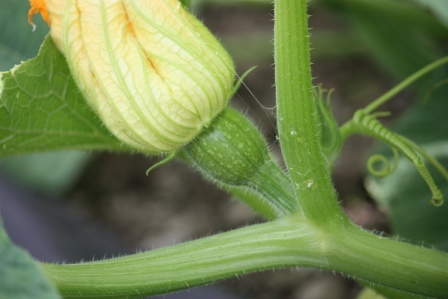 I have a bunch of these tiny little pumpkins … I’m not sure if they are too late to develop fully. We’ll have to wait and see. My “Before” picture of some of our blueberries. 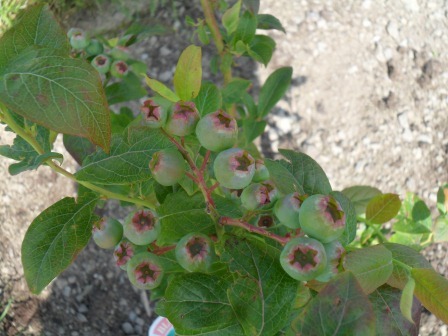 The “After” picture of some of our blueberries! They were sweet and delicious! 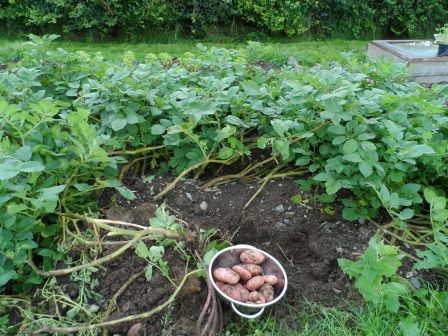 The bed of Organic Sarpo Mira potatoes, our dinner’s worth, and the fork to lift them out with! They really are a great size! We’re delighted with their taste, too. 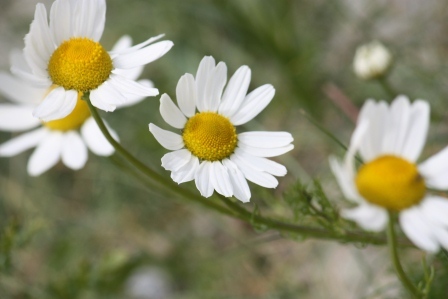 I have to have a picture of flowers in my post! This was about 6 PM this evening. After yet another very wet day, the evening was simply beautiful. And for that I am very, very thankful. 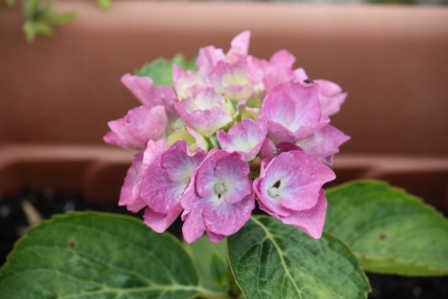 From sharing flowers … to growing a Hydrangea from a cutting. Having friends who like to share their flowers is such a great thing. A lot of my garden (flowers and fruits) are from friends and family. My friend Susan has such a beautiful and well loved garden. 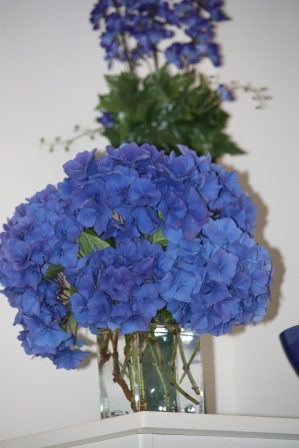 After one visit to her last year, I left with a gorgeous bouquet of blue hydrangea. I had the arrangement up high in my kitchen, and well, just left it there. Some of the blooms actually dried, which I think is also very pretty. One bloom had just enough water to grow roots. Roots! 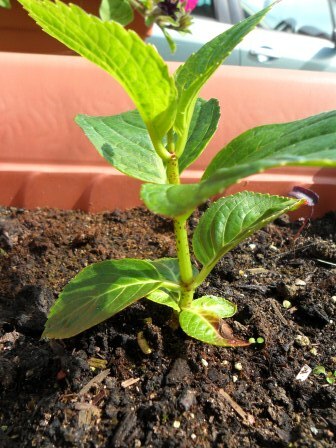 O.K., for those with Green Thumbs this would be no big deal, but for me it was huge! 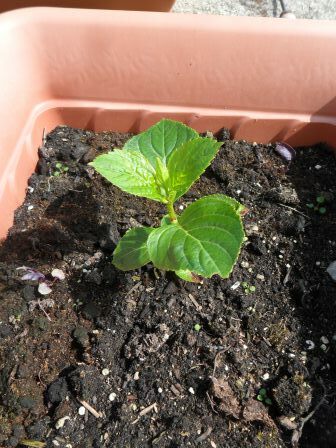 I put the cutting in a small pot, out of the sun, in our laundry room. I watched it die down, and then miraculously start to grow again. 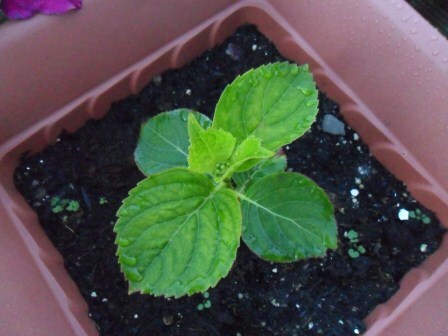 I waited until I had transplanted it into a bigger pot before even telling Susan. I didn’t want to take any chances that it might not make it! 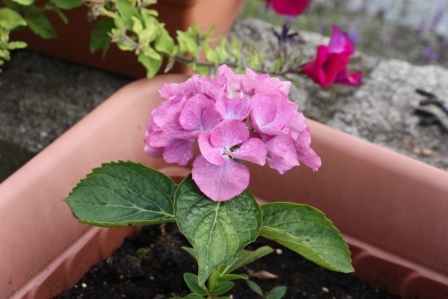 Now it is in a bigger pot, with a big flower and seeming to be very happy. The color has changed; it’s now pink. I only have it in a peat/compost mixture though. 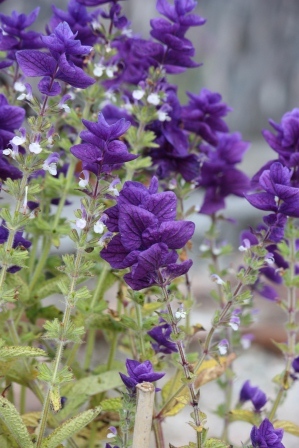 I’ll have to wait until I plant it in the soil to see what color it will be in my garden. 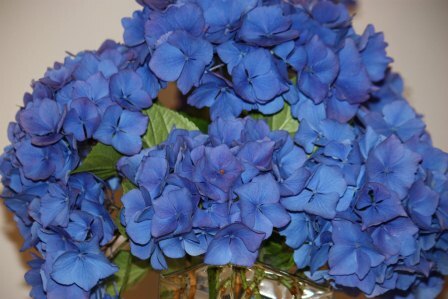 A beautiful blue hydrangea. from Susan’s garden. Cut flowers of hydrangea, sitting up high in my kitchen. Side view of more growth. 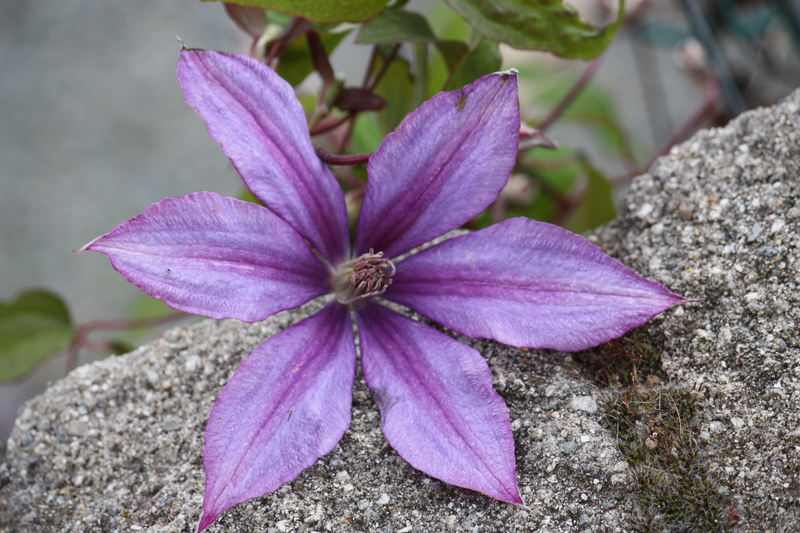 A flower! 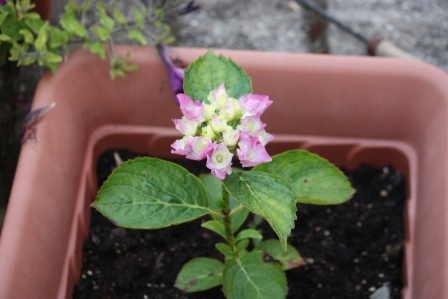 It’s not blue, but it’s only in a pot of compost/peat. We’ll see what color it turns after it’s eventually planted in my garden. Still growing and getting more pink in color. 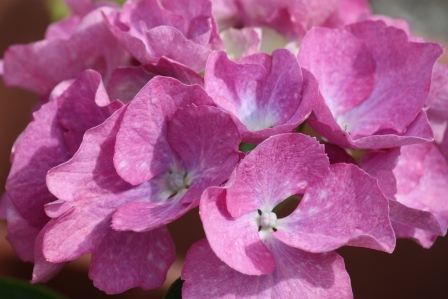 This is officially known at my house as “Susan’s Hydrangea”! 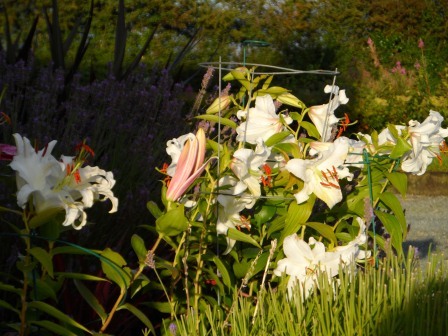 Some fabulous scents are in the garden now, which is perfect timing since the lavender is finished. 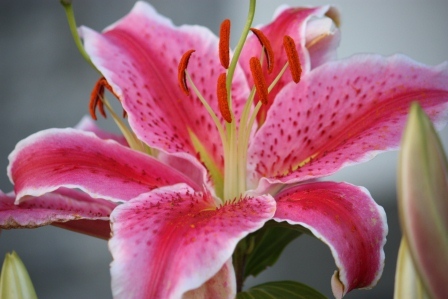 This is my flower of the moment! I love how it smells just walking past the garden! The lilies are in among my lavender plants. We get so much wind that I have to stake them (ok, it’s not very pretty – I’ll have to seek out a prettier system next year!). You can see in the front I’ve trimmed the lavender plant, and I still have to trim the one in the left background. 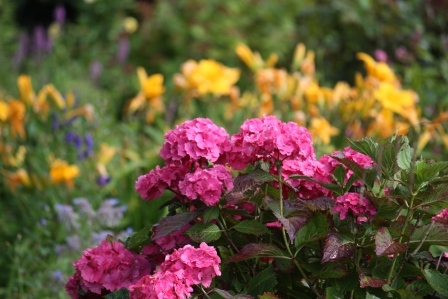 Roses, Hydrangeas and Poppies for some summertime beauty. I hope you like them. And that they make you feel happy too! 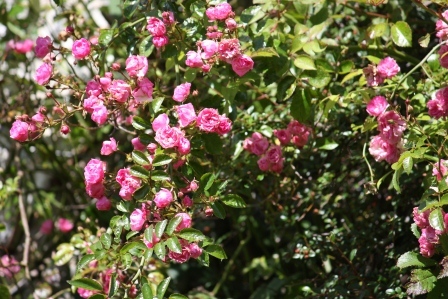 A cluster of my climbing roses (Zephirine Drouhin). I’m so happy with their brightness factor on our fence! 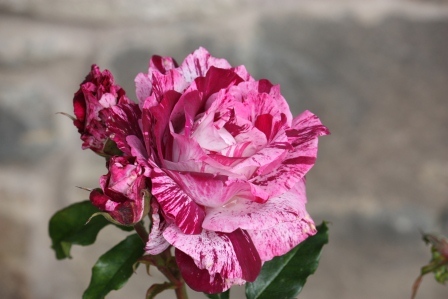 I really liked the lighting on this Zephirine Drouhin Climbing rose. 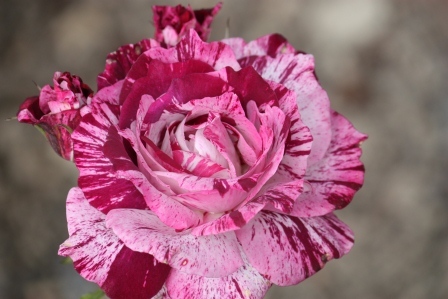 What a splash of color this beautiful Tiger Rose adds to a garden! 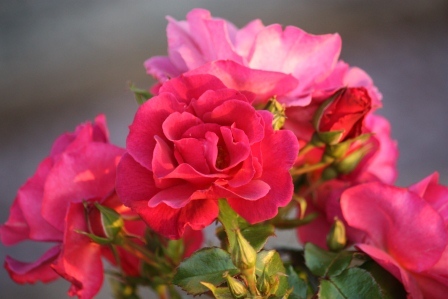 Evening sunlight softens the color tone of my Burgundy Ice Floribunda Rose. 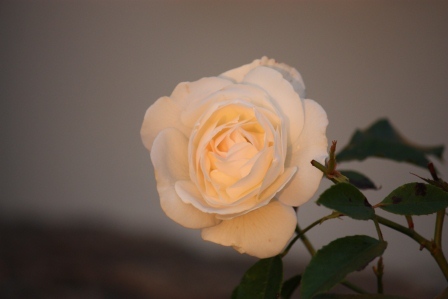 Evening sunlight on my Iceberg Floribunda Rose. I can’t resist taking pictures in the evening! 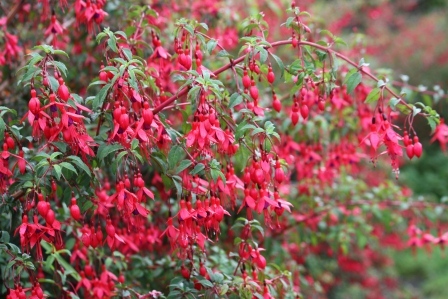 Fuchsia is a very popular plant in Ireland. 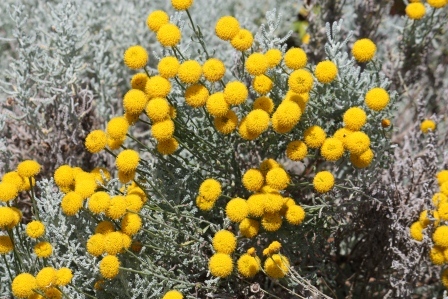 It’s not uncommon to find it growing in hedges in the West. 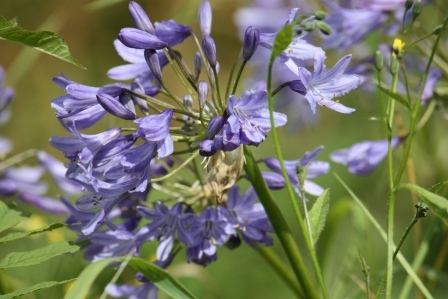 It was introduced to Ireland in the mid-19th century from Chile & Argentina. 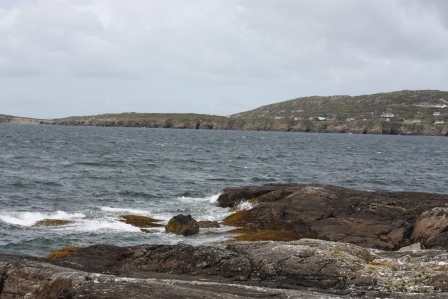 (This picture was taken in County Mayo). 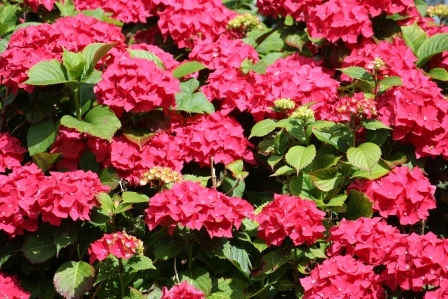 Is it any surprise that I have a picture of a Hydrangea? 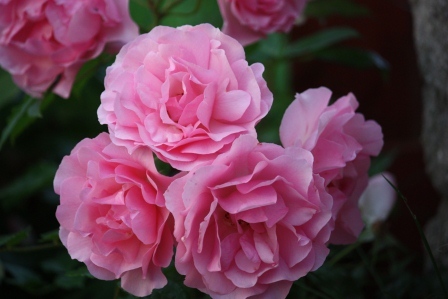 I love their high cheerfulness factor! 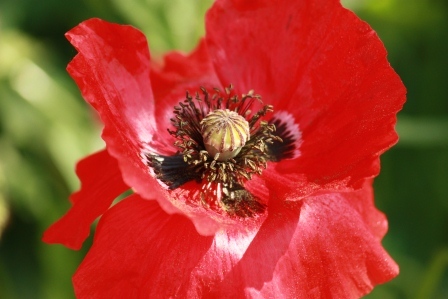 My poppies on a glorious morning! 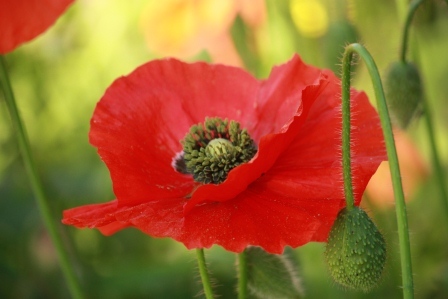 A different view of the poppies. 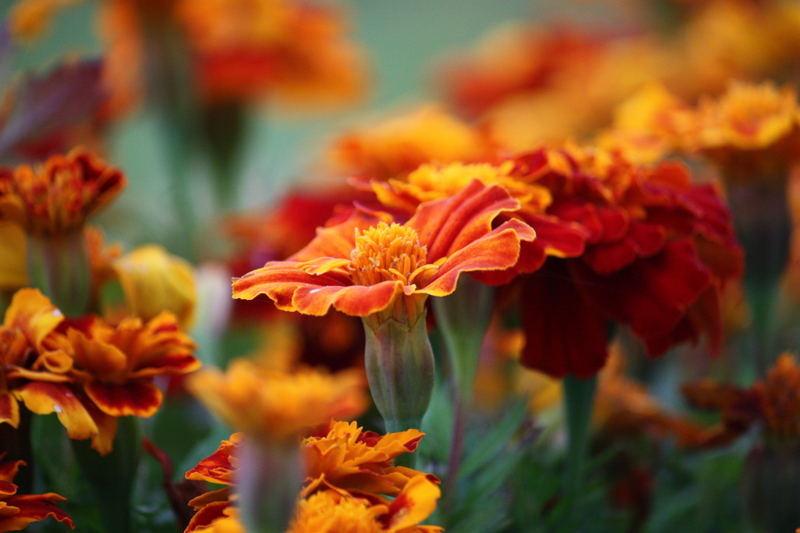 Marigolds to finish the post with. 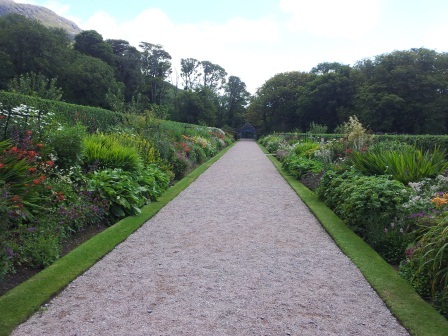 A beautiful visit to Kylemore Abbey & Victorian Walled Gardens, Connemara Ireland. 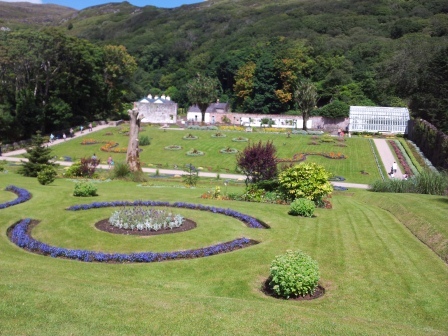 The first full sunny day of our holidays beckoned us to visit Kylemore Abbey & Victorian Walled Gardens. 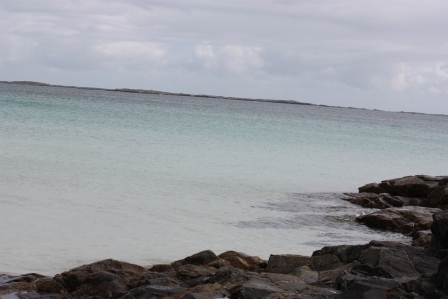 It is simply beautiful, and if you are in Connemara it is well worth the visit. www.kylemoreabbeytourism.ie Admission for our family of five was 33 euros (about $40). The first worker we came across was a lovely Irish girl who informed us that midgets (very annoying, small mosquito like bugs) love the Connemara area, and that the best defense for them was spraying on Skin So Soft (an Avon product)! She kindly handed us her bottle and said “here, you can spray your family”. So then we were armed to enjoy our day at the Gardens. 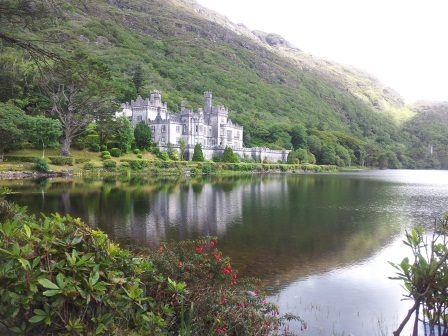 Kylemore Abbey sits on 1000 acres with woodland, lakeshore, and the largest Victorian walled garden in Ireland. 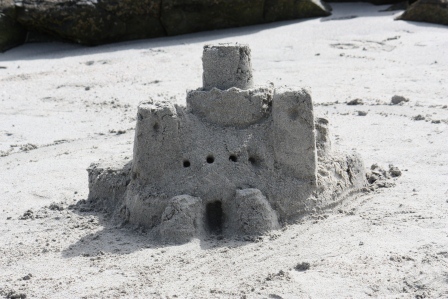 The castle was built in 1867 by Mitchell Henry (as a romantic gift!) for his wife Margaret. Tragically, Margaret died in 1874. 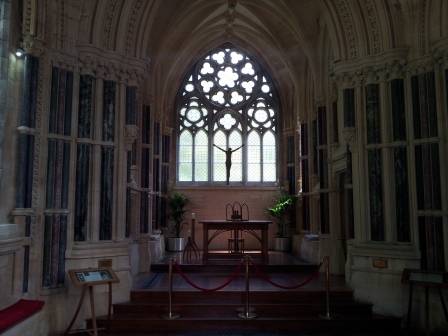 In 1877 a Gothic Church was built on the property as a memorial to her. It is often described as a cathedral in miniature due to its proportions. 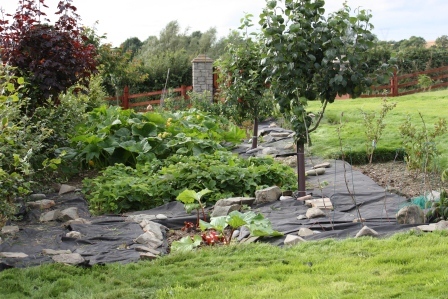 It is beautiful, with pillars of stone from the 4 provinces of Ireland: red Cork marble from Munster, black Kilkenny marble from Leinster, green Connemara marble from Connaught, grey Armagh marble from Ulster. 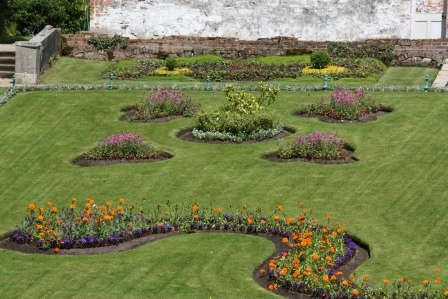 The 6 acre walled gardens have been restored to some of their 1870s majestic splendor. 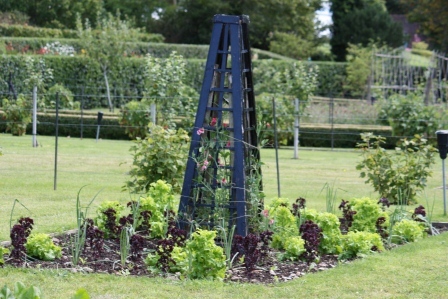 They only have plants and vegetables which grew in Victorian times, growing them all from seed on the grounds. 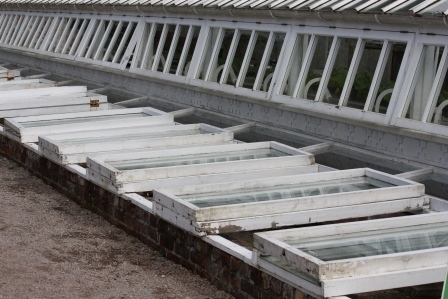 So far, two of the original 21 glass houses have been restored. I was surprised to learn of the exotic fruits they used to grow in them. Fruits such as bananas, melons, grapes, and figs were grown and sometimes shipped to England. 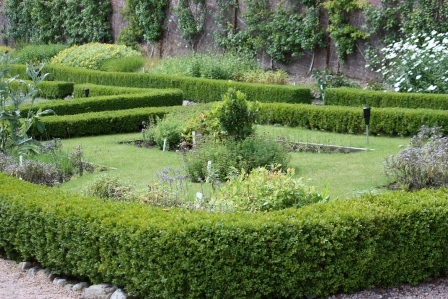 The garden is divided into two areas; a kitchen garden and a flower garden, with trees and a stream dividing the two. 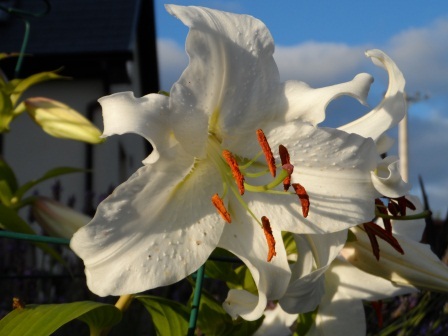 Since 1920 Kylemore has been home to a community of nuns of the Benedictine Order. They are the directors of the Kylemore Trust, keeping a close eye on how the Kylemore estate is run today. In addition to their spiritual daily routine, they run their farm and make handcrafted products such as soaps, sweets, and jams. 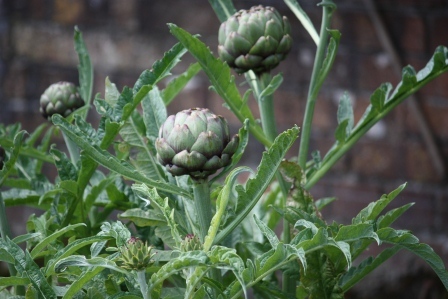 I must get back to my garden plans … they need some adjusting after this visit! 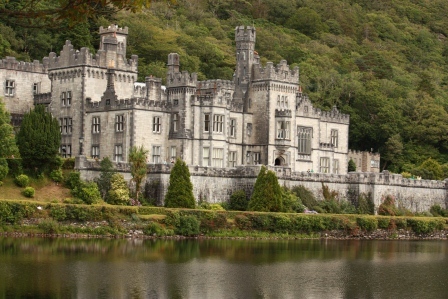 View of Kylemore Castle from the far side of the lake. In order to preserve the family’s privacy, Mr. Henry had the main road re-routed to the far side of the lake, and used the original road, which runs in front of the castle, as his personal access road around the estate. The Gothic Church. Note the stone which comes from around Ireland. 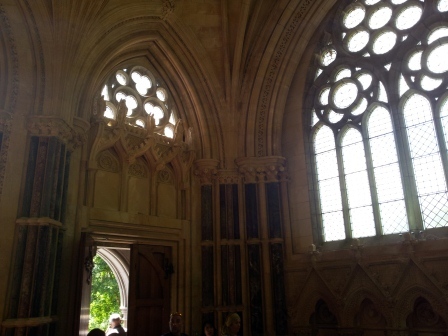 The Gothic church is often described as a cathedral in miniature. 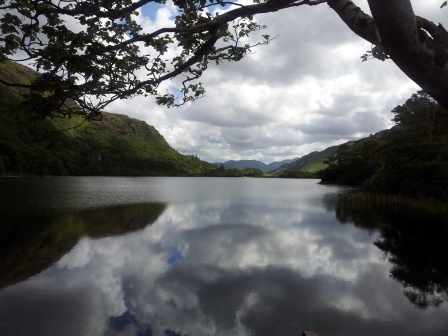 View around the lake at Kylemore Abbey. The gardens captivated me! They were incredibly neat and tidy, with so many different sections! I’ve tried to give a glimpse of as much as I could. We were lucky to manage some photos with very few people – it’s just how the flow of people moved. I hope you like the little virtual tour! 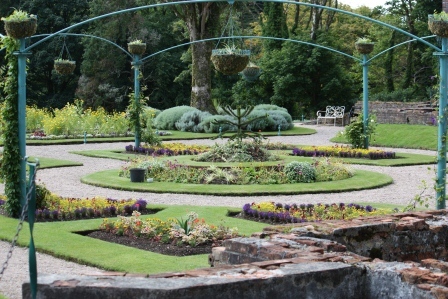 The flower garden side of the walled gardens. Flower garden side of walled gardens. 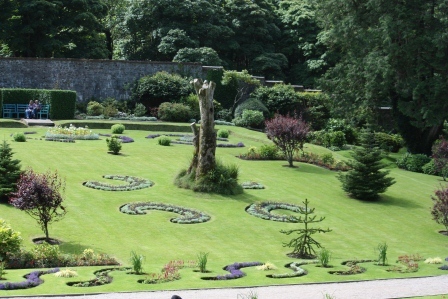 The designs are exactly as they were in the original gardens. 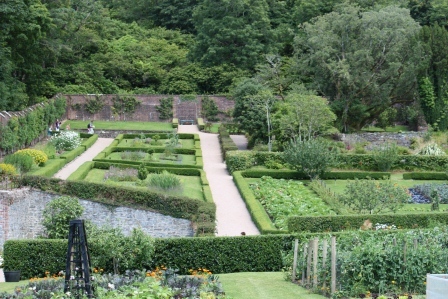 The kitchen garden side of the walled gardens. 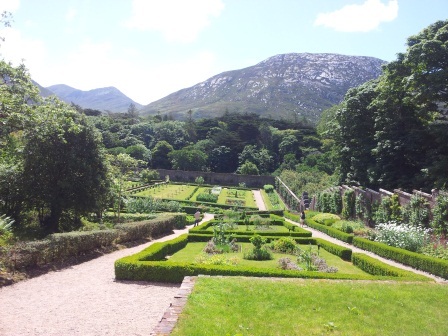 View of the mountains from the kitchen garden side of walled gardens. 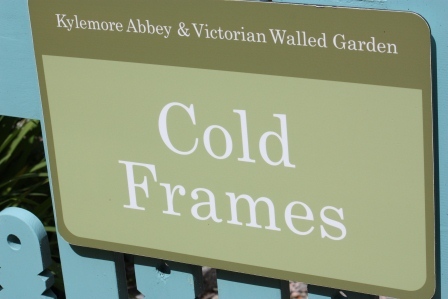 Some of the cold frames. 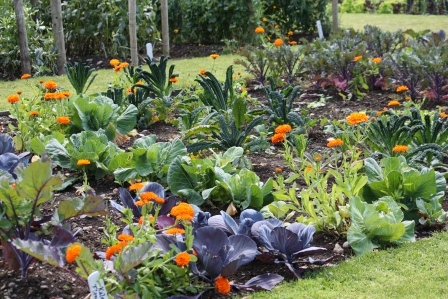 All of the plants at Kylemore are started from seed on the grounds. 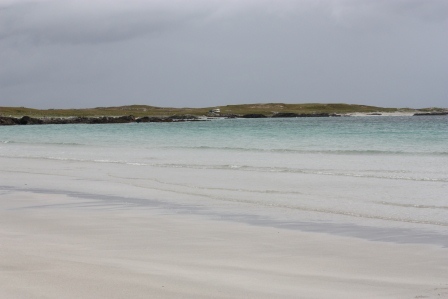 Beaches in Connemara, County Galway, Ireland. 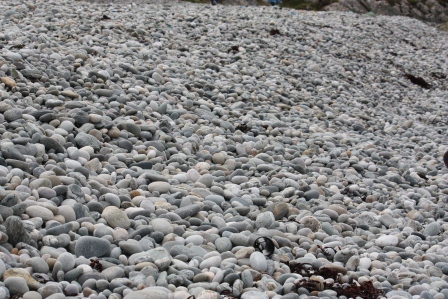 One beach we visited was completely covered in stones, with no sand at all. 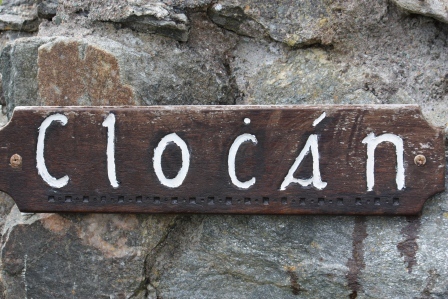 We had to drive through a pillared gate to get to the beach and the sign appropriately read “stones” in Irish (clocán). It was a short visit, but so neat to see. 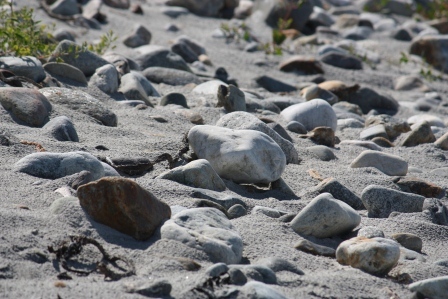 Here are pictures from some of the beaches, and some wildflowers. I just bought a fantastic handbook of Ireland’s wild flowers. 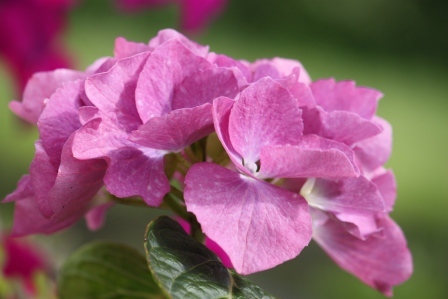 It is great to be able to put a name on all of the flowers we so often see! Will you be visiting Ireland any time soon? What are you hoping to see? Irish sign on the stone beach in Errislannan. 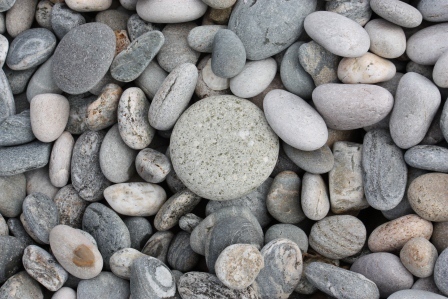 A beach of stones in Errislannan, Connemara. 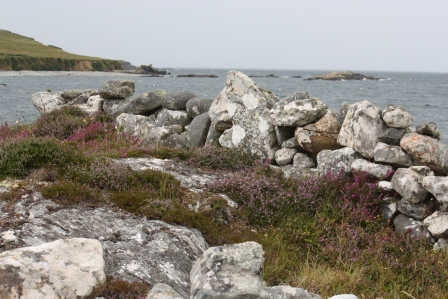 Stone wall with bell heather in Errislannan, Connemara. 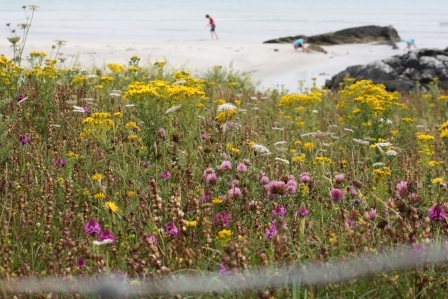 Wild flowers of ragwort, pyramidal orchid and wild carrot, and my kids playing on the beach in Ballyconneely. 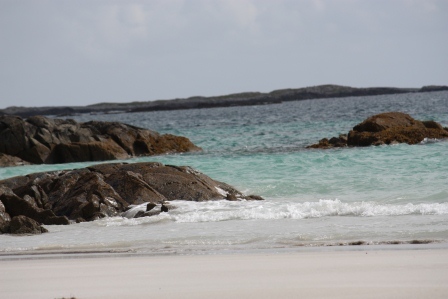 A pristine beach in Ballyconneely, Connemara. 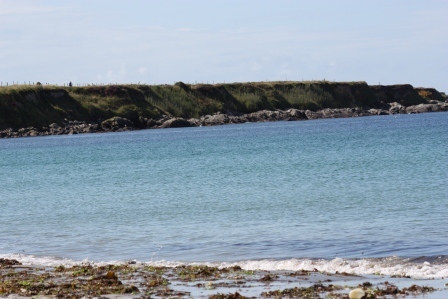 A pristine beach all to ourselves in Ballyconneely, Connemara. 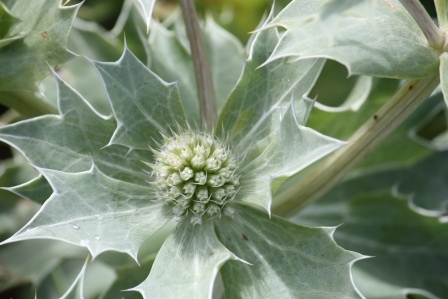 Sea Holly blooms in June, July & August. Only found by the sea, sandy strands and on the front of sand-dunes. 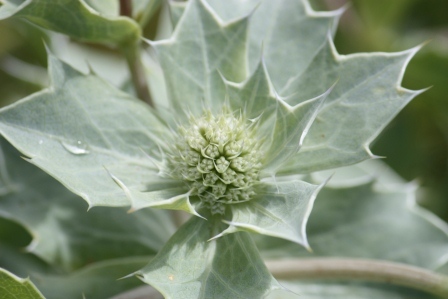 Sea Holly – an Irish wild flower. 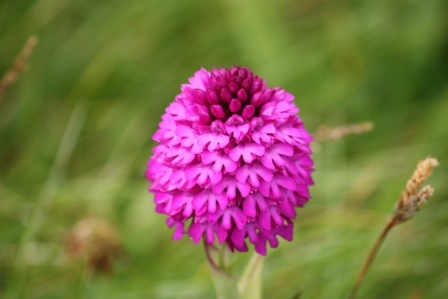 The Pyramidal Orchid, an Irish wild flower, flowers from June through August, and can be found in dry grassland and sand-dunes. On another day, on another beach in Ballyconneally (in the rain). Connemara. 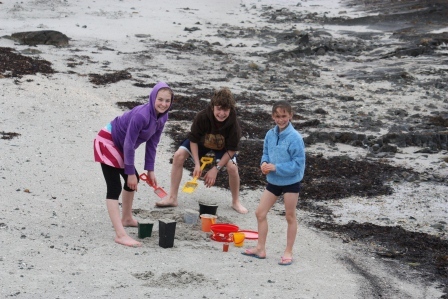 Three happy kids on a sunny day in Cleggan, Connemara.